Arguably the prettiest duck in North America, the male Wood Duck has a chestnut brown breast, green crested head, bright red eyes, and bold white outlines. Females are warm brown with a white tear-drop eye ring. This duck truly looks like a hand-painted work of art. 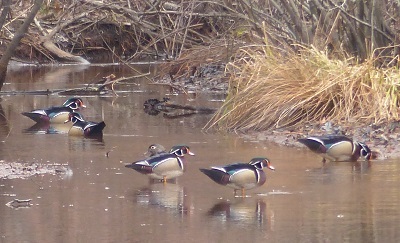 Although some will move a little south for the winter, Wood Ducks can be found year round in New Jersey. 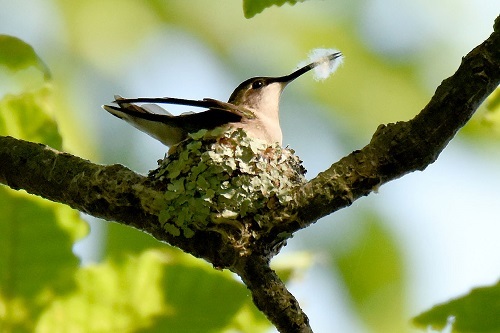 The population of these cavity nesting birds was in steep decline in the late 19th century due to overharvesting for their meat, the high demand for their feathers used in ladies hats, and loss of habitat - large trees with cavities. Is That a Sunflower Seed…In a Tree? Photo taken at Tatum Park. 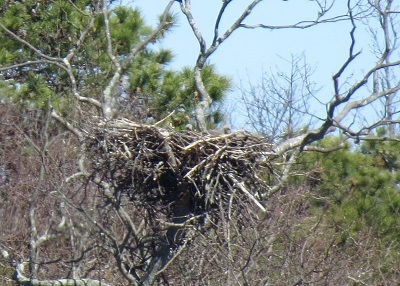 Manasquan Reservoir Naturalists have been eagerly watching the eagles’ nest anticipating hatching. 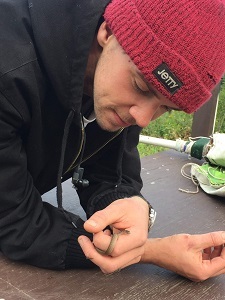 Since staff cannot view directly into the nest, they look for behaviors indicating the eggs have hatched. After incubating 35 plus days, behaviors consist with hatching were observed including one of the adult eagles reaching down into the nest and delicately feeding a chick. 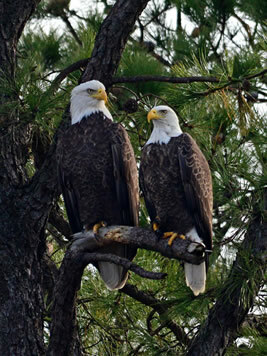 This eagle pair has been mated for at least 10 years and they are very experienced and gentle parents. The new eaglet(s) are now very small and weak. They cannot be seen yet. It may be a couple for weeks before we spot them and can count how many are in the nest. Eagles typically have between one and three chicks per season. The eaglets will grow very quickly and at six weeks be nearly the size of their adult parents. 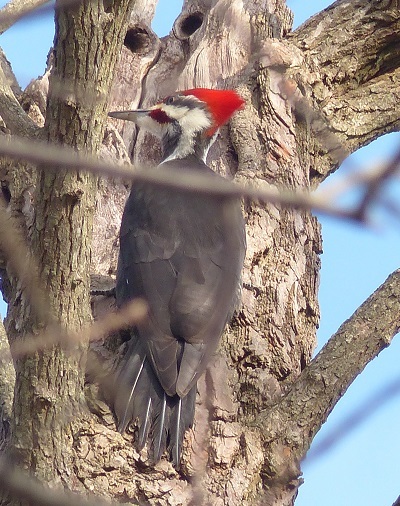 This is a good time of the year to see a Pileated Woodpecker. There are few leaves to offer cover so it easier to locate them when they are knocking on a tree in search of food. The Pileated Woodpecker is the largest woodpecker in North America. That is unless you are one of the die-hard believers that think the Ivory-billed Woodpecker is still alive and well and hiding out in the backwoods of Arkansas, Louisiana, Florida or Texas. The Pileated is about the size of a crow, 16 to 19 inches long, weighs 8.8 to 12.3 oz. and has a wing span of 26 to 30 inches. They prefer mature forests. Manasquan Reservoir Bald Eagles Incubation Begins! I find hawks tricky to tell apart. Many times you are either looking up at the underside of a bird overhead, or, like this one, within the branches of tree. And, when consulting my bird guide, I can’t always see the ‘defining’ trait! I often ask the bird to spin around so I can see if he has a wing bar or a rusty-reddish crest that I can’t see, but they never comply! I always take my camera with me when I go birding. I’m not expecting to get an amazing shot. I just find it easier to look at the bird right then, by magnifying it on my camera, or later on my computer. 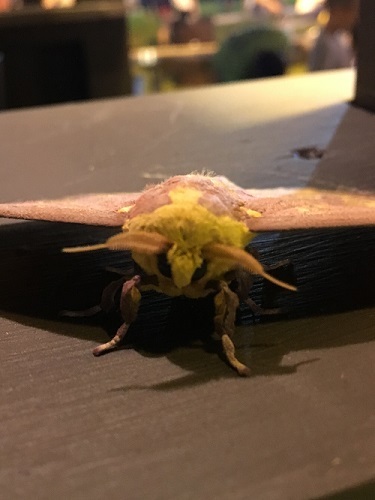 If I need help identifying it, having a photo helps. 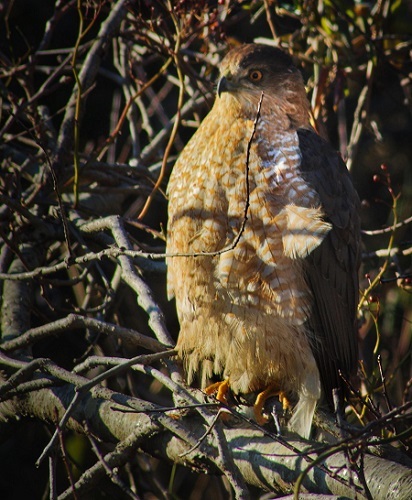 This is a Cooper’s Hawk that I saw on Sunday. 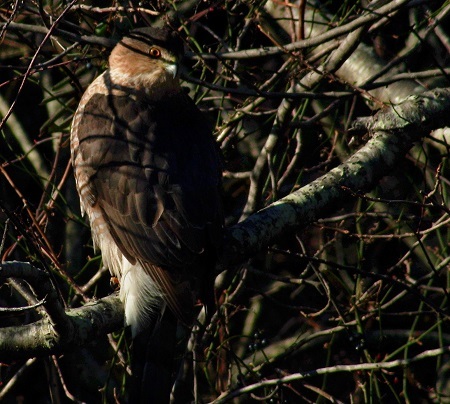 It is a medium-sized raptor often seen flying within the dense canopy of trees in wooded areas. 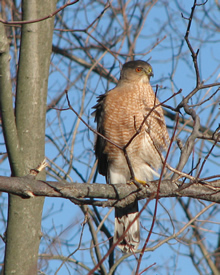 Cooper’s Hawks prey on other birds and are excellent flyers. They are swift and nimble and are able to catch a bird, such as a robin or blue jay, in flight. While they form faithful pairs for a season or two, most do not mate for life. The males are much smaller than the females although both are similar in coloration. 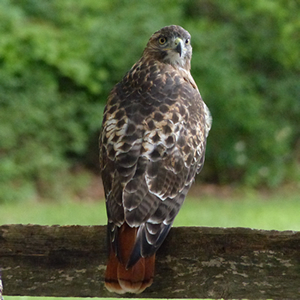 Cooper’s Hawks can live for between 12 and 20 years. Their main threat is habitat loss. 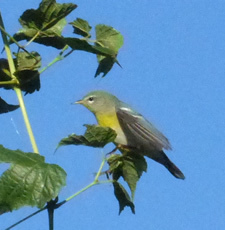 I was having trouble identifying this bird and thought I would share the tip that my ‘birding mentor’ gave me. When trying to tell the difference between a Cooper’s Hawk and a Sharp-shinned hawk perched in a tree, draw an imaginary line from the top of its beak toward the back of its head. 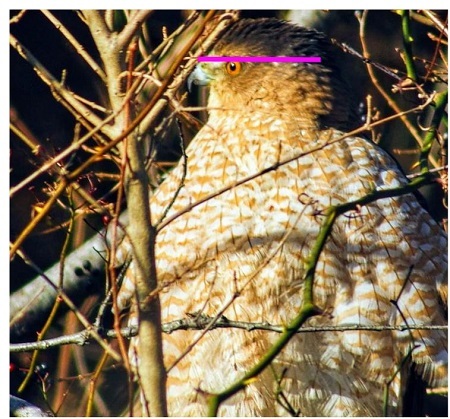 If its eyes are below the line, it is a Cooper’s Hawk. 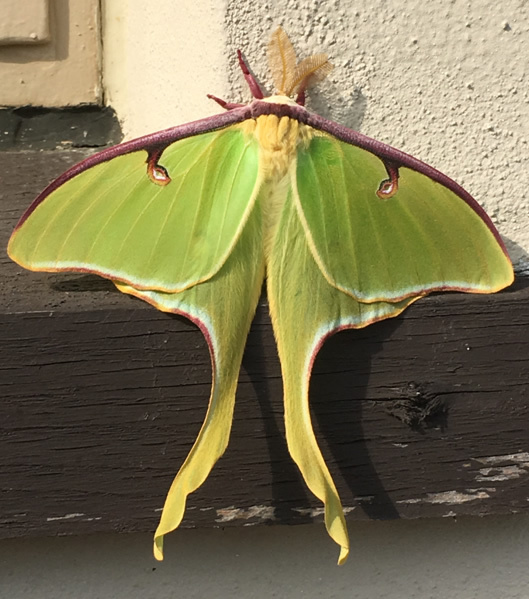 Luckily, this fellow showed me his profile! Winter brings many birds southward where temperatures are more moderate and food is a bit easier to find. 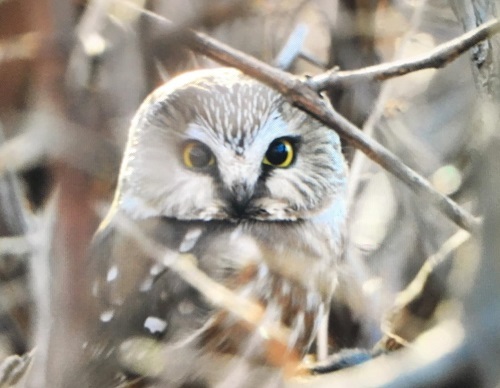 The Northern Saw-whet Owl is one such winter visitor to our parks. These birds are among the smallest raptors in North America. They are about 7 to 8 inches long, weigh between 3.3 and 5.3 ounces and have a wingspan of 16.5 to 18.9 inches. Saw-whets breed in the northern half of North American with some areas extending on the east coast into New York and into the northern half of Pennsylvania, out west the breeding range extends down into the Rockies as far south as New Mexico and Arizona, and along the west coast into the middle of California. 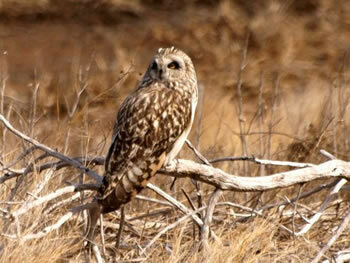 These owls are monogamous for the season and will have a brood of four to six chicks. 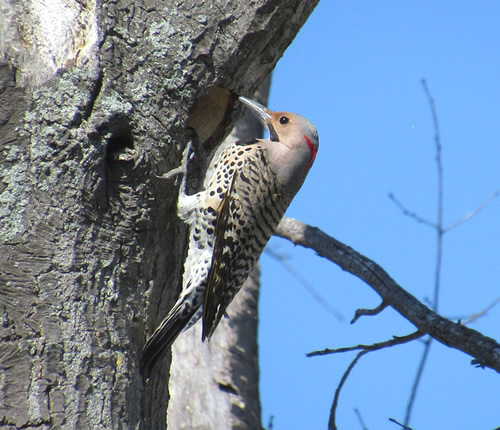 They are cavity nesters, often using cavities abandoned by northern flickers and hairy woodpeckers. Northern Saw-whets only live for about two to four years in the wild, with the longest known wild bird having lived seven years. Captive birds have lived as long as seventeen years. The owl is named for its call which can sound like a saw blade being sharpened on a whetstone (I am sure everyone knows that sound). 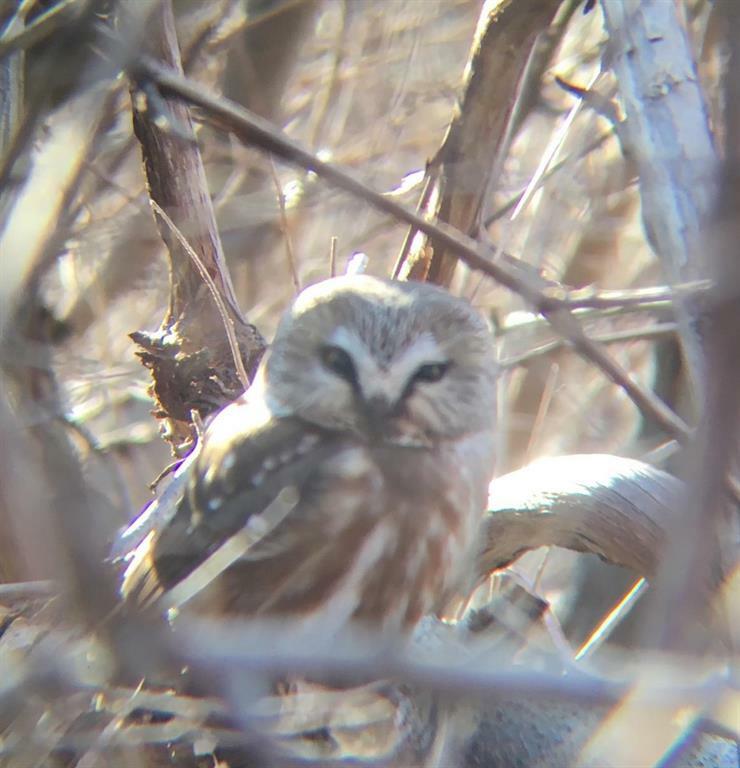 Northern Saw-whets start arriving in New Jersey as early as October and some may stay until mid April. Winter is a great time of the year to get out and see what kind of winterfowl have migrated down from the Arctic where they breed in the summer. 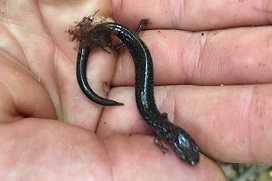 New Jersey is home to a number of impressive species that can be found in our local waterways. For those willing endure the cold, make sure to bundle up before heading out in search of these beautiful birds during the cold winter months. 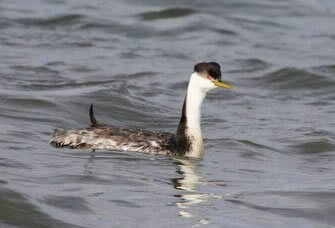 The Red-throated Loon, Gavia stellate, is the smallest of the loon species. 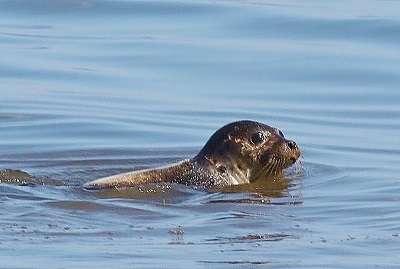 This one was spotted swimming along the Manasquan Inlet near Fisherman’s Cove Conservation Area. These Purple Sandpipers, Calidris maritima, winter along rocky shores of the Atlantic Coast and were spotted at the end of the jetty at the Manasquan Inlet near Fisherman’s Cove Conservation Area. This male northern Shoveler, Spatula clypeata, is easily spotted even from far away with its large bill and bright colors. Found feeding at the Manasquan Reservoir Environmental Center. These Hooded Mergansers, Lophodytes cucullatus, are an extravagantly crested little duck that frequents small ponds and rivers in the winter and were found feeding at the pond at the Manasquan Reservoir Visitor Center. This male Gadwall, Mareca strepera, can be easily overlooked especially by novice birders because of its non-flashy colors compared to most male ducks of other species; however, it has a simple elegance. 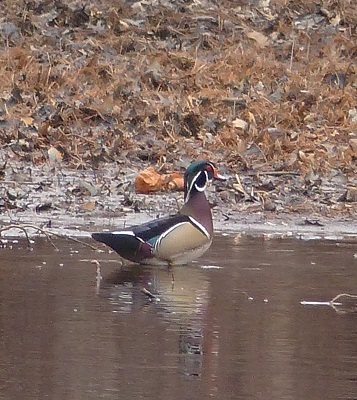 It was seen feeding among the other ducks at the Manasquan Reservoir. 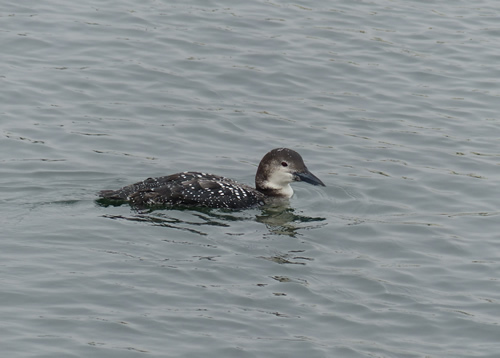 This Common Loon, Gavia immer, can be found around seacoasts during the winter with its modest plain gray coloring. 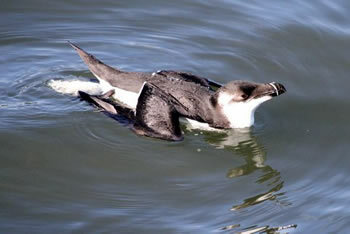 Multiple common loons were seen feeding at the Manasquan Inlet near Fisherman’s Cove Conservation Area. This immature male Common Eider, Somateria mollissima, has a distinctive sloped forhead and white molting on its back. 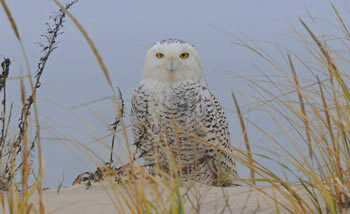 It was spotted at the end of the jetty at the Manasquan Inlet near Fisherman’s Cove Conservation Area. Common Eiders are the largest duck found in the northern hemisphere. 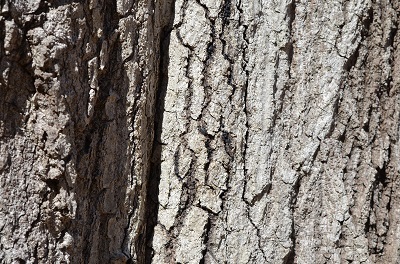 This Brown Creeper, Certhia americana, was spotted in the woods alongside the Manasquan Reservoir Visitor Center. 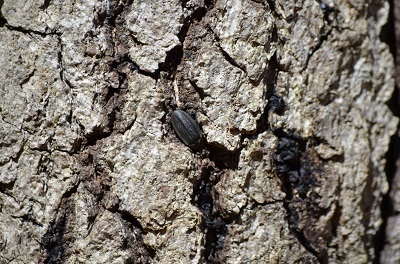 They are easily spotted by its signature spiraling up of large trees looking for insects hidden among the bark of trees. Fall is a great time of year to get outside and look for wildlife, specifically birds. Lots of birds are out feeding as they migrate through the area. Some birds we are getting the last glimpses for the year and other birds are just arriving for the season. It’s a great time to brush up on your bird IDs by checking out what the fall plumage for birds will be in our area, adding a fun challenge to bird Identification. 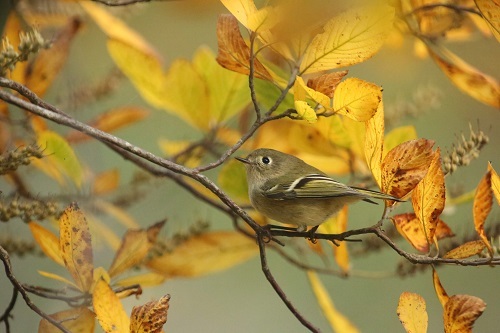 Ruby Crowned Kinglet, Regulus calendula, at the Manasquan Reservoir Environmental Center seen hopping and feeding inside a sweet pepper bush, Clethra alnifolia. A difficult ID to make for most beginner birders is this immature female Common YellowThroat, Geothlypis trichas, at the Manasquan Reservoir Environmental Center front pond. 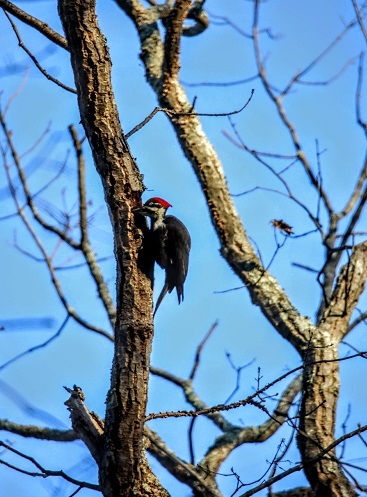 A Pileated Woodpecker, Dryocopus pileatus, was spotted along the trail at the Manasquan Reservoir with its mate. 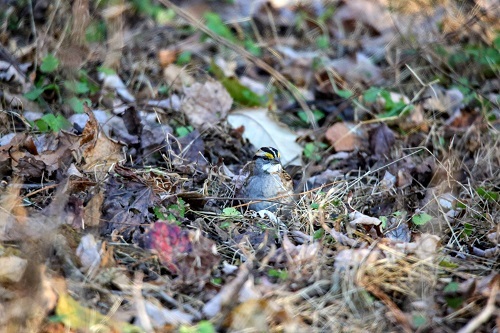 White-throated Sparrow, Zonotrichia albicollis, found foraging for food among the leaves at the Manasquan Reservoir. Love taking photos of nature? Why not submit an application (or two) for our photography exhibits at Deep Cut Gardens and the Manasquan Reservoir Environmental Center. Both exhibits are using The Cycle of Life theme. Youth, amateur adult and professional divisions. See details for the Deep Cut Gardens Exhibit and details for the Manasquan Reservoir Environmental Center’s Exhibit. The deadline to enter is December 15th. 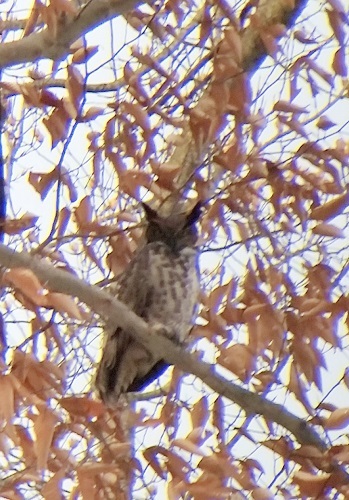 This is the time of year to look for Great Horned Owls as there are fewer leaves on the trees and it makes them easier to spot. 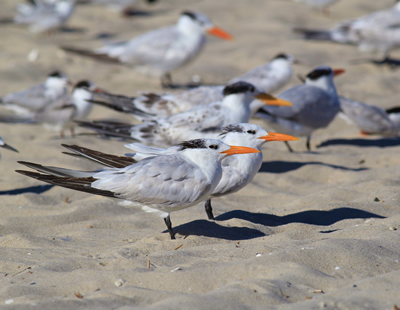 The birds also start searching for lifetime mates and setting up nesting territories so they are very active and very vocal. The typical “WhooWhooWhooing” easily identifies these large nocturnal and sometimes crepuscular raptors. The Great Horned Owls do not build their own nest, but prefer to take over an abandoned hawk’s nest, crow’s nest, osprey’s nest, or even an unattended bald eagle’s nest. They may also make use of a large hollow in a tree. 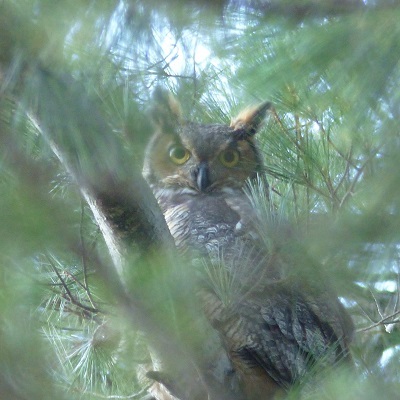 The Great Horned Owl is a year-round resident in Monmouth County and can be found in all of our heavily wooded parks. They have one brood per year, laying one to four eggs between late January and early March. With a 44 inch wing span and a average weight of 3.1 pounds, they are considered apex predators. I am always hoping to see a rare or unusual bird and migration season is a good time to be on the lookout. An experienced birder once told me that a good place to spot an uncommon bird is within a flock of migrating, common birds. So, every spring and fall I get out my binoculars and scan flocks of Canada Geese, Brant, Starlings, Cowbirds and more. This past week I got lucky! A flock of sleeping Rudy Ducks caught my eye and, as I scanned through them, someone looked different – a little bigger than the rest. I pulled out the binoculars and sure enough, there was a stranger with the flock! I took a few photos to use once I got home and could pull out my bird book. Bingo! A Eurasian Widgeon. 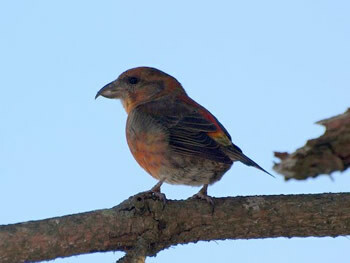 A new bird for my life list and an uncommon visitor to Monmouth County. Eurasian Widgeons are native to Europe and Asia, migrating seasonally between the two. While there are rare sightings of these beautiful birds in North America each year, they are not considered native to the New World and there have been no records of them breeding here. There have been some reported cases of them interbreeding with American Widgeons. 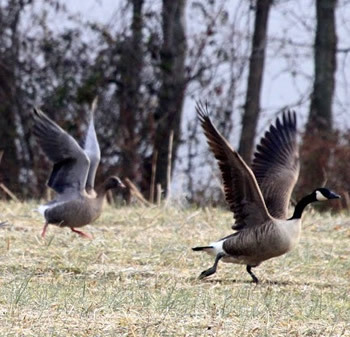 The Eurasian Widgeons seen here are likely from eastern Siberia or Iceland. There are only three species of widgeon in the world, the Eurasian Wigeon (Mareca penelope), the American Wigeon (M. americana) and the Chiloé Wigeon (M. sibilatrix). 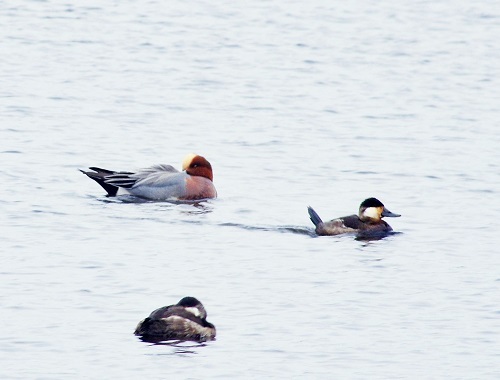 The males of all three are very colorful while only the females of the Chiloe Widgeon are also. They are dabbling ducks, eating from the bottom of shallow water by tipping their heads down rather than diving. Therefore, a good place to look for Widgeons is along the edges of shallow water. 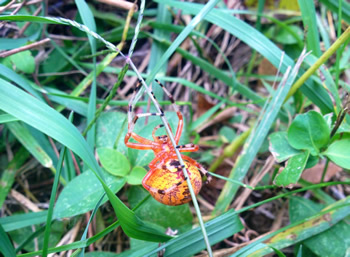 October is a beautiful time of year - the leaves are falling, the temperature is beautiful, and lots of creatures are on the move. It is also a great time of year to go out birding as birds are starting to migrate south for the winter and head to warmer weather. It’s the perfect time to see fall warblers, birds of prey, and wintering ducks. 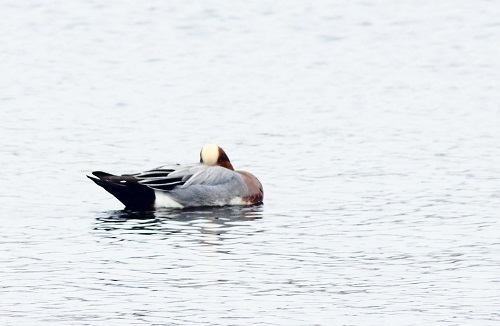 PICTURED - An Eurasian Wigeon, Mareca penelope, spotted at Lake Como on October 25 (left); an American Wigeon, Mareca americana, spotted at Silver Lake in Belmar on October 24 (center); and a Ruddy Duck, Oxyura jamaicensis, one of the first winter duck migrants to arrive in Monmouth County, at the Manasquan Reservoir on October 24 (right). 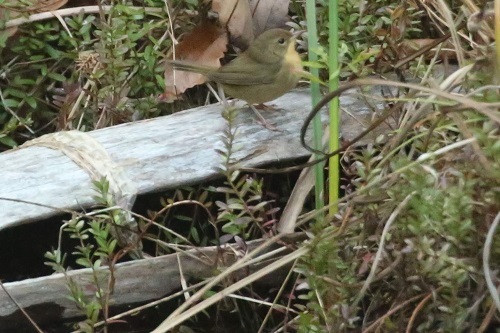 PICTURED – A Yellow Rumped Warbler, Setophaga coronata, the only wintering warbler of New Jersey spotted in large numbers, at the Shark River Inlet in Belmar on October 22 (left); a Palm Warbler, Setophaga palmarum, at Assunpink Wildlife Management Area on October 14 (center); and an American Kestrel, Falco sparverius, spotted at Assunpink Wildlife Management Area on October 14 (right). 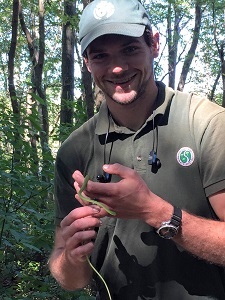 PICTURED – A Northern Brown Snake, Storeria dekayi, found at Huber Woods during the stage set up for the Creatures of the Night program on October 19 (left); Park Naturalist Blake Beyer holding a northern Brown Snake, Storeria dekayi, also found at Huber Woods during the stage set up for the Creatures of the Night program to be relocated to a safe location on October 19 (right). 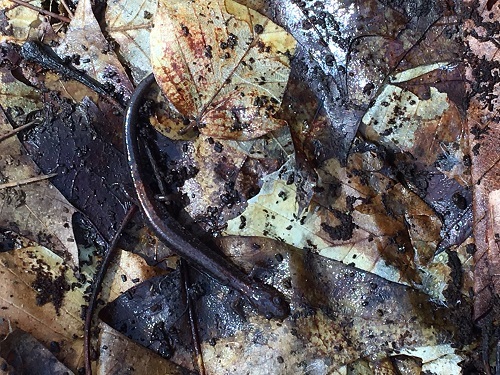 PICTURED - A Northern Watersnake, Nerodia sipedon, found at the Manasquan Reservoir on October 17 (left); a Northern Slimy Salamander, Plethodon glutinosus, found at Huber Woods by Naturalist Blake Beyer, Ruth Carll, and Paul Mandala on October 2 (right). 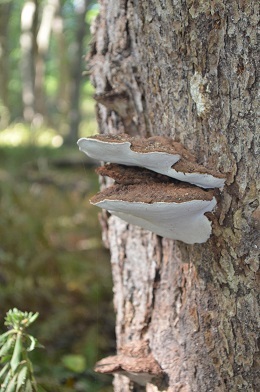 This week on our Awesome Autumn Amble, the forest was covered with many different types of fungi. 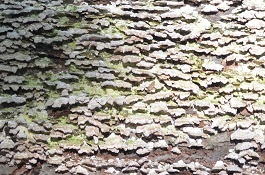 These three examples below are all members of the Polypore group, their signature characteristic being a harder cap called a Conk. 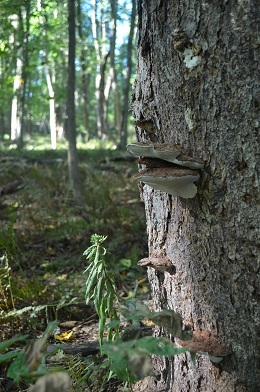 Polypores typically grow on or nearby dying or dead trees, and are a vital part of nutrient recycling in a forest! 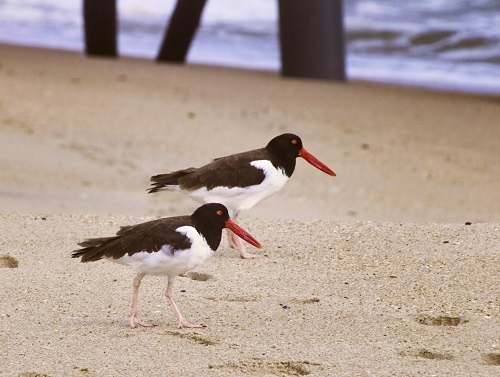 What is that shore bird with the big orange beak? Each morning at the Manasquan Reservoir Environmental Center, staff checks on monarch chrysalides they have been raising to see if new butterflies have emerged. On September 4 staff was amazed to find two white monarchs. Over the next few days they found two more, totaling four. Monarch butterflies (Danaus pleixppus) are known for their easily recognizable orange and black wings. 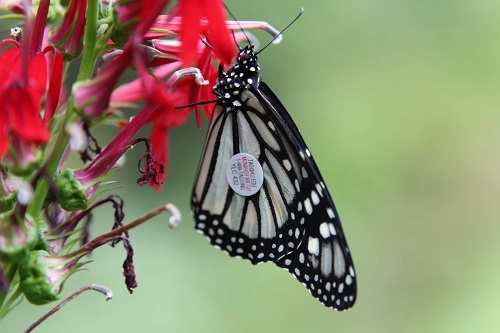 These markings help warn predators of the monarchs toxicity. White monarchs (Danaus pleixppus nivosis) have grey where the orange color is normally found. White monarchs still have the toxicity to predators but lack the color to warn them away. These white morphs were the result of a rare recessive gene. 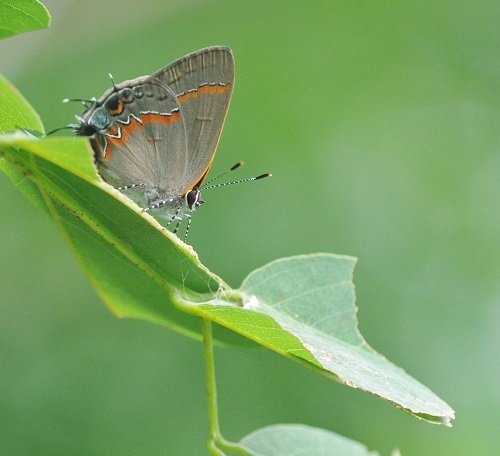 While the exact mechanism is not known, one recent study suggests the gene may cause their wing scales to be bent instead of lying flat and neatly overlapping, and this may somehow prevent the deposit of the orange pigment. It is a very rare event to see white monarchs in the wild. But sometimes when monarchs populations are isolated or inbred the white monarchs appear. So how did the Environmental Center have these butterflies? 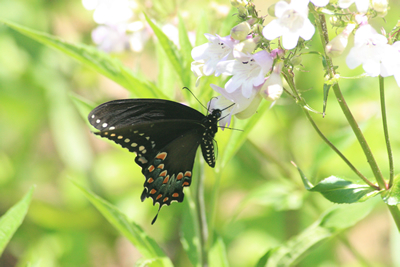 Usually, staff collect out monarch’s eggs and caterpillars from our gardens or volunteer’s gardens. This year in late August, we received a donation of caterpillars. These caterpillars and resulting butterflies were the result of inbreeding. The four butterflies appeared healthy. 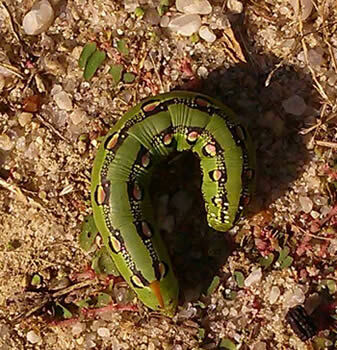 Prior to emergence, there was nothing unusual about the caterpillars or chrysalides that would have indicated the surprising color. These birds are typical members of a group called “thrushes.” Thrushes are medium-sized birds with soft feathers, plump bodies and alert postures. 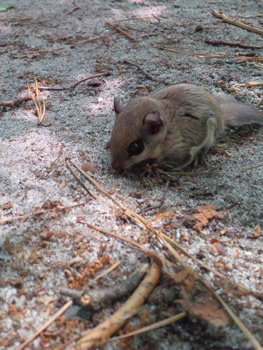 They have long wings compared to their bodies while their tail and legs are fairly short. Their bills are short and straight as they are predominantly insect eaters. 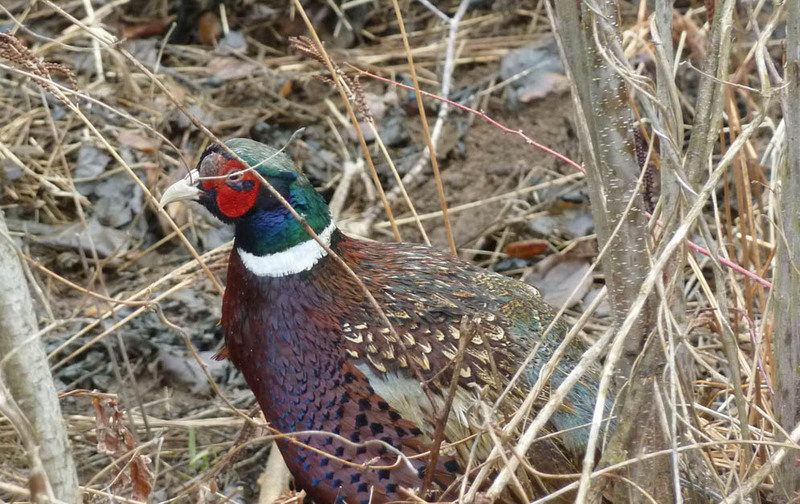 Usually the female, and sometimes the male, have speckled breasts. 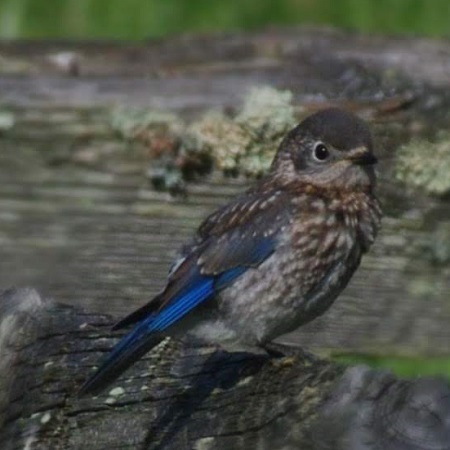 Eastern Bluebirds are unique among thrushes when it comes to nest building. They are the only thrush which are cavity nesters. This is why they will easily take up residence in bird houses if they are placed in open areas such as meadows or fields. 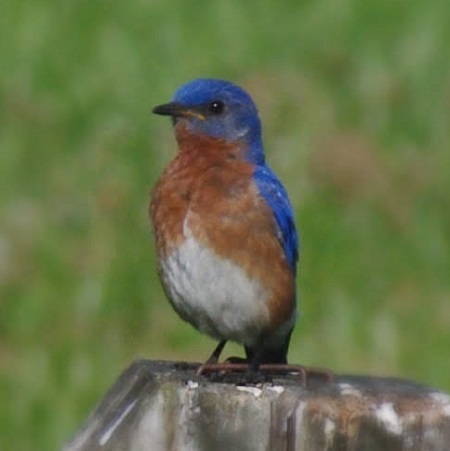 Male Eastern Bluebirds are blue with rust breasts and throats. Females are gray and speckled with a blue bar on their wings and tail. 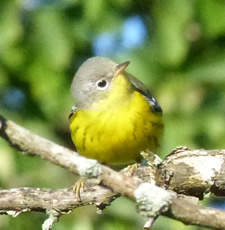 Females may have some rust color on their breast as well. 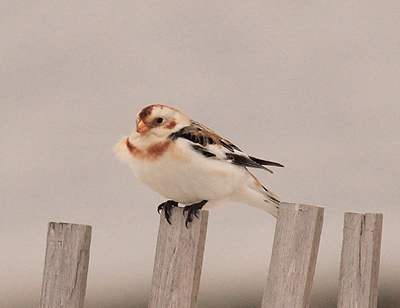 These birds are most often seen perched on wires and fence posts as they look for insects. 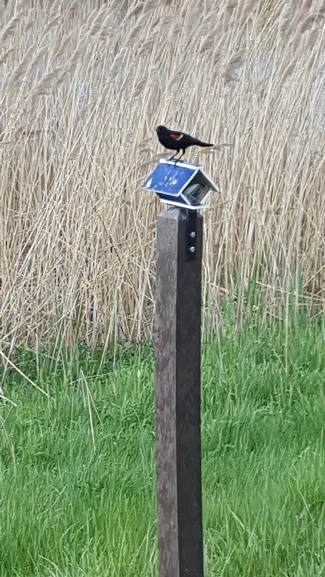 Their population is on the increase due to the many nesting boxes that are being installed along Bluebird Trails, in many public parks, along pastures and even golf courses. 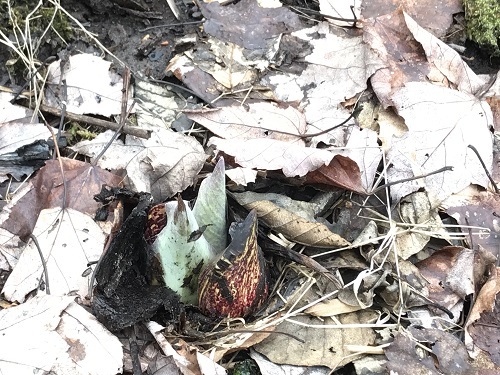 You know winter is nearing its end when Eastern Skunk Cabbage starts to pop up! 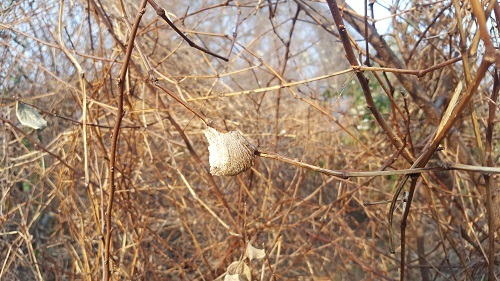 The newly emerged plants shown in the photos above were spied during an afternoon stroll along the Marsh Trail in Holmdel Park, Holmdel. 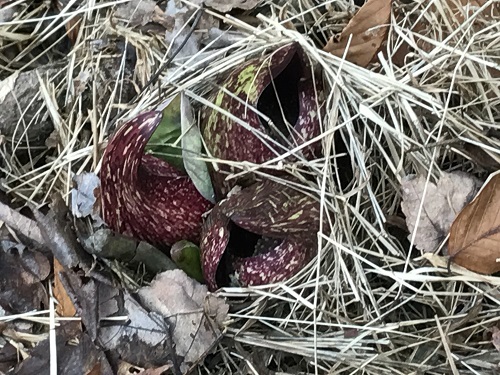 Eastern Skunk Cabbage, Symplocarpus foetidus, is easily recognizable by its purple, green, and yellow streaked spathe, the specialized leaves that form a protective hood around its flowers. A peek through the spathe’s small opening shows the club-shaped spadix covered with a cluster of tiny yellow flowers. As both its common and scientific name imply, Skunk Cabbage is a malodorous plant. 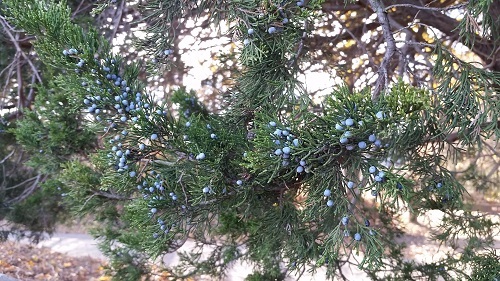 The stinkiness and bitter taste of its leaves and flowers repel hungry herbivores like deer and rabbits hunting for late winter meals. Not all are repelled by the fetid odors, however. By mimicking decaying flesh, Skunk Cabbage entices carrion loving insects and other early spring pollinators to visit and consequently pollinate its flowers. 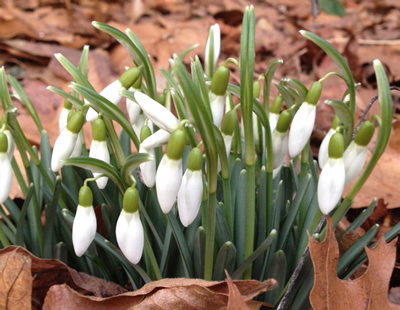 It is good to see that so many survived the big freeze in January! These beautiful birds are hard to mistake for other birds as they have a wingspan of up to 6 and a half feet and can be almost 5 feet tall. 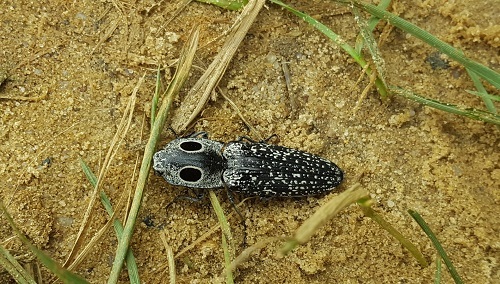 They are mostly light gray with some black and rust marking on the head and throat. Their face and neck are usually a lighter gray than their bodies. When in flight, they have a slow wing beat and their long legs hang straight behind them. Unexpectedly, these birds nest it trees. 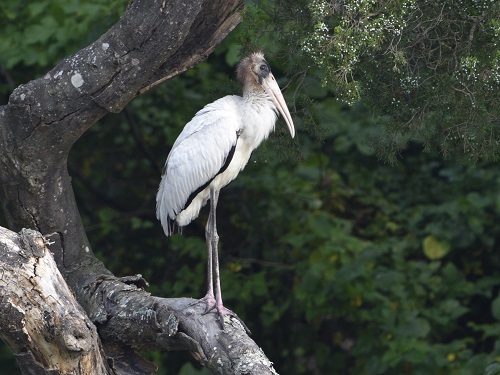 You wouldn’t think that they could go unnoticed in a tree but their long legs and slender bodies blend in very well with branches making them almost invisible. 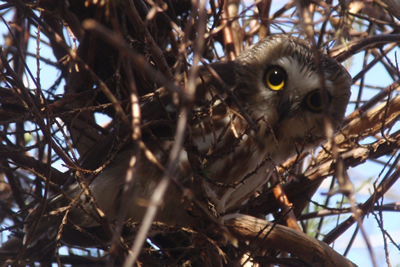 They build large nests with sticks and grasses. The nest must be large enough to hold 3 to 5 young for about 60 days. If they can’t find a suitable place off the ground, they may nest in reeds on the ground. It you are anxiously awaiting the chance to get out on the trails, bundle up and head out! 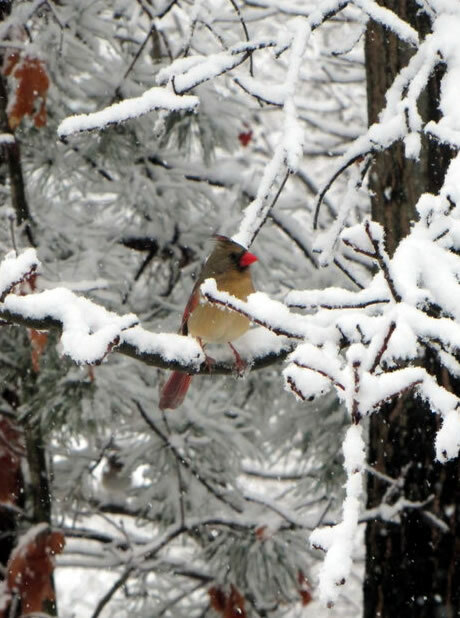 It is the perfect time for birding. 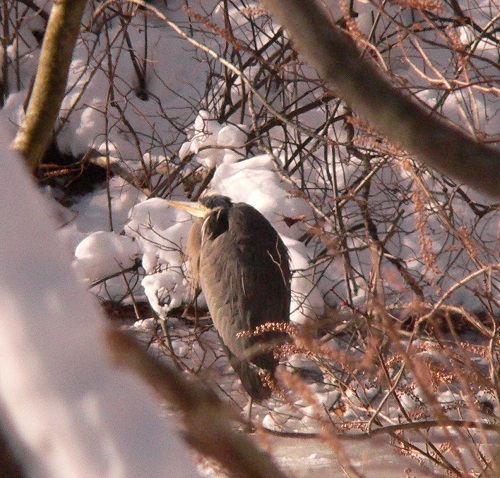 Great Blue Herons are a common sight as are many interesting, winter-season ducks. 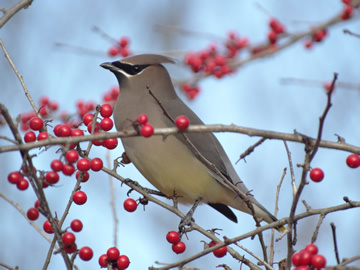 Others birds that are here year round are active and easy to spot in the bare branches of winter. 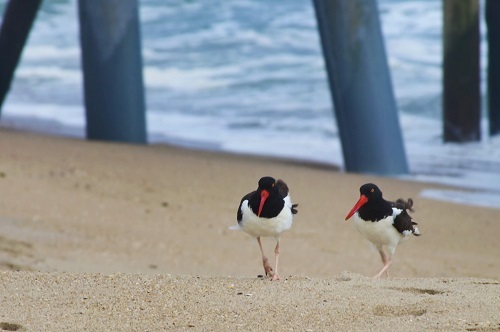 If you would like to learn more about native birds, join a Casual Birder walk with a park naturalist. The next session is Thursday, February 22 at 9 a.m. at Hominy Path on Matthews Road adjacent to the Hominy Hill Golf Course. On Sunday, January 21, our resident Bald Eagle pair began incubation. Immediately upon producing their first egg, one of the adults will almost always be sitting on the nest. Over the following days, an additional egg or two may be produced. With hatching generally occurring 35-40 days after the egg is laid, we expect eaglets at the end of February or beginning of March. 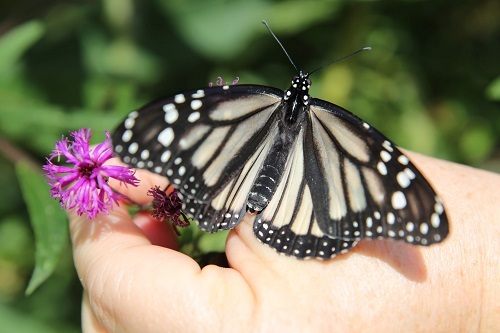 This summer staff and volunteers at the Manasquan Reservoir Environmental Center raised 172 monarch butterflies from eggs and caterpillars collected from the site’s butterfly garden. These eggs and caterpillars were given daily care and lots of milkweed to eat. Milkweed is the host plant of the monarch and as such is the only plant that the monarch butterfly will lay its eggs on and the caterpillar will eat. Staff and volunteers released each butterfly within hours after emerging from its chrysalis. Hey, Is That Goldenrod or Is it That Other Plant Goldenrod? Autumn, what a wonderful time of year! Apple cider, cool crisp nights, and everything under the sun is pumpkin flavored. With autumn comes a dazzling array of colors displayed all around us. And you needn’t only look to the trees for the show. I am talking about wildflowers, goldenrod to be precise! 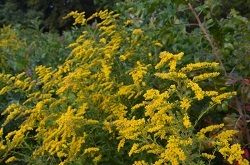 It seems as if people back in the day started calling any yellow flower in autumn a goldenrod. 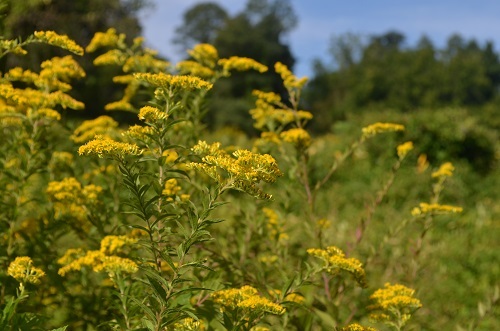 Did you know, there are over 100 species of goldenrod native to North America? 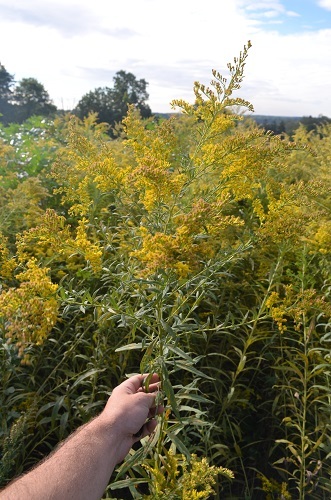 The exact number changes all of the time as researchers debate whether certain goldenrods are truly a different species, or just a variety of an existing one. 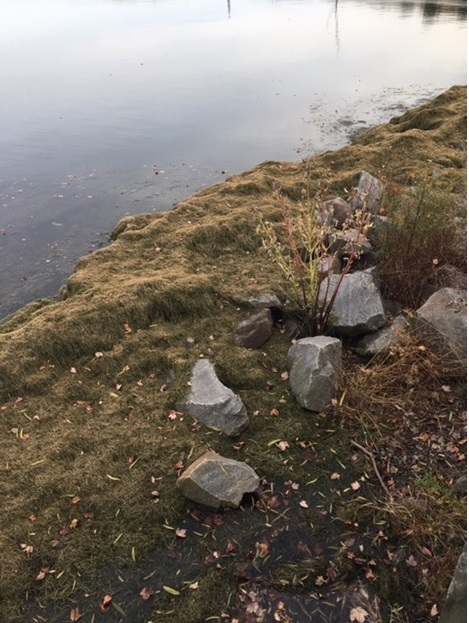 The next time you pass by a meadow or notice some weedy goldenrod growing along a path, take note of the differently shaped leaves, stems, and flower arrangements. 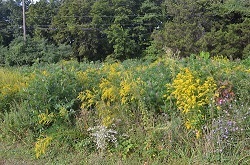 Here at Huber Woods Park, you can find at least five different goldenrod types within a thirty minute walk around the meadows. 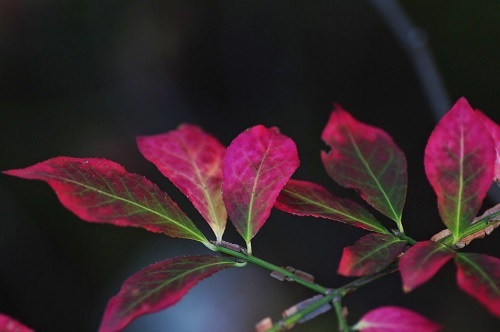 Pictured - Winged Euonymus or Burning Bush (Euonymus japonica) is a common landscape plant but can also be found in the wild and is considered invasive. While some governors swear the leaves in their state change color to support tourism, reality is stranger than fiction. In order to answer what seems like a simple question, we need to first understand why leave have different colors to begin with. 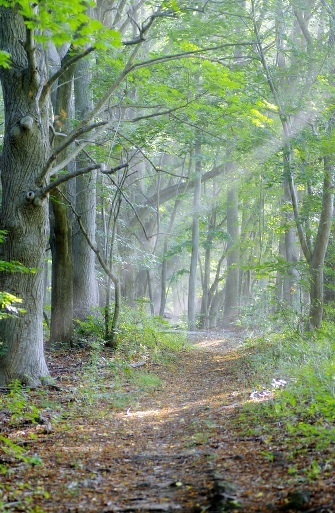 Leaves use sunlight to power the system that makes the sugar, or food, they need to survive. To make the most sugar possible, they collect all the sunlight they can. Of the rainbow of colors in sunlight, plants only use blue, green and red light as energy. The plant need to ‘catch’ each color of light and the nets it uses are pigments (colors) within the leaves. Each color of light needs a specific pigment to catch it. Orange and yellow leaf pigments catch blue light. Red pigment catches blue and green light. Green pigment, however, is the most prevalent because it catches the most energetic light color, red, thus getting the most energy possible. 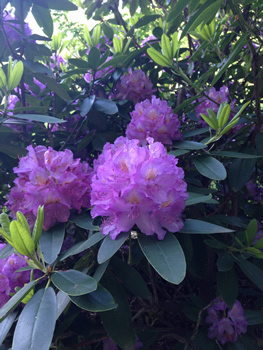 Because it is the dominant pigment, plants look green even though they have the other colors too. 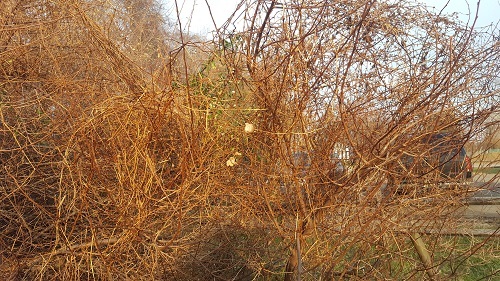 Trees, other than evergreens, drop their leaves in winter when they go dormant and don’t need to make food. When the tree cuts off water to the leaves, the highest energy-needing pigment “dies” first and the leaves lose their green. After green, the yellow recedes followed by red. Finally the leaf turns brown, dies and drops. Different species have different color concentrations of pigments and that is why they are different colors after the green fades. 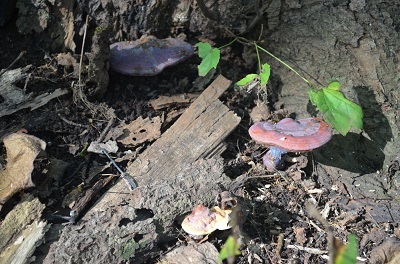 I am often asked about the identity of mushrooms along the trails. The next questions is ALWAYS “Is it edible?” And, while sometimes I am sure that the specimen in question is edible, I usually say that I don’t know. This is because there are so many mushrooms that look alike that I don’t want to chance saying yes and being wrong. Almost every mushroom hunter I know has eaten something that they shouldn’t have and they will all tell you to be safe rather than sorry. That said, there a few edibles that can’t be mistaken for anything other than what they are. Three of these are shown below and all can be found at this time of year. Another option is to try your hand at growing your own mushrooms. 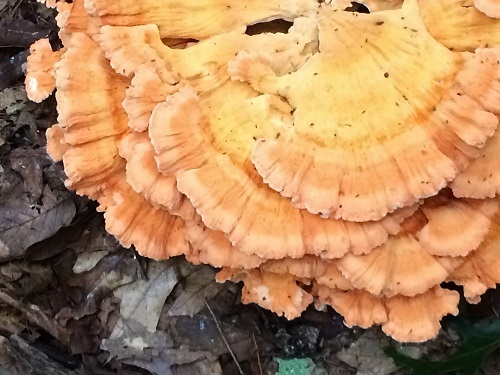 If this is of interest, register for Cultivating Mushrooms Workshop on Sunday, October 7, 2017. 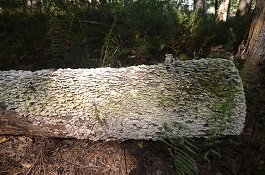 You will go home with a log infected with different kinds of mushrooms that are guaranteed to be delicious! 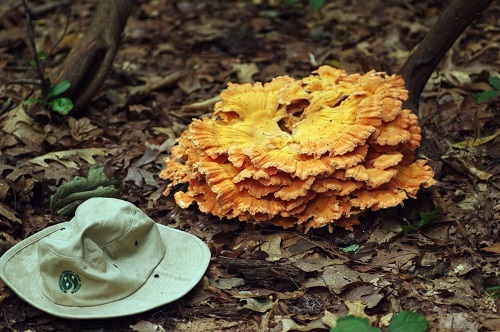 This large, orange-yellow fungus is the most brightly colored one I know. 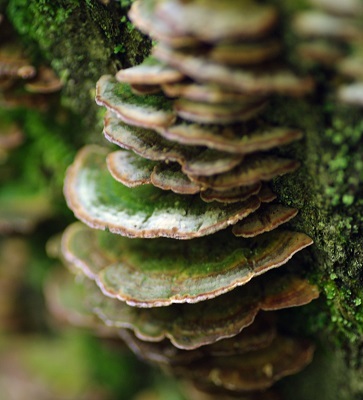 It’s ruffled ‘shelves’ can be found growing in rosettes on the ground or from the base of trees. 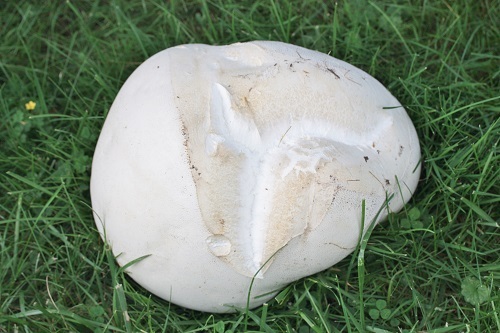 This puffball is regularly seen in grassy areas and grows very large. This one, on the lawn at Thompson Park caught my eye because I thought it was a socor ball that had been left behind in a field. This interesting mushroom looks like its name! The black spores and gills beneath the cap are distinct and, when that stem is cut, there will be a pinkish red color inside. “It” washed up on the beach at Bayshore Waterfront Park. It was a rubbery, sticky glob of … something. Something that was obviously a living creature. How exciting! “It” is a cluster of sea grape tunicates (Molgula manhattensis). These small, round animals are filter feeders and live attached to rocks, boats, sand and docks. You can see two tiny bumps on each of the round bodies in the photos. These bumps are “in” and “out” siphons used by the animals to pump water through its body for filter feeding. They are very hardy and are extremely tolerant of murky or polluted water. This species was first reported in Long Island Sound in 1838 and is now found from Maine to Louisiana. 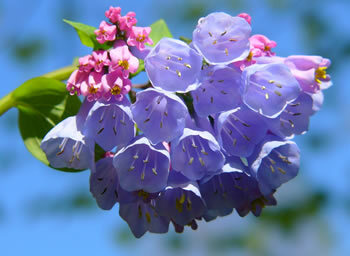 It is native to the Atlantic and is commonly found in this area and in Europe. Unfortunately, it is also becoming common in areas of the Pacific where it is not native. 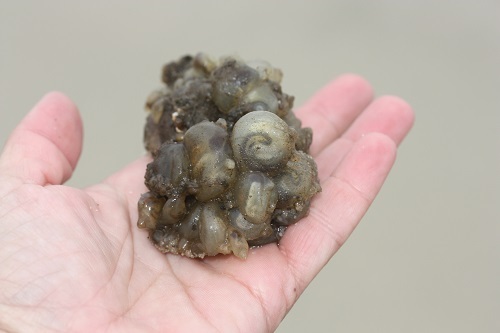 There, the sea grape tunicate is considered a secondary threat level – not a top priority but becoming problematic. While they don’t look very threatening, they are particularly prolific spawners, in some cases, reproducing once every 24 hours when the water temperature warms to the right conditions. Because of this they can outcompete native organisms for food and space. At the Manasquan Reservoir Environmental Center, we’ve been watching the eagles’ nest in anticipation of their eggs hatching. This morning we observed the adult eagles reaching down into the nest and (presumably) feeding a chick. This behavior tells us that at least one chick has hatched. Eagles typically have between 1 and 3 chicks per season. It will be about two weeks before we know how many eaglets are present. It takes this long for the chicks to grow enough to hold their heads above the nest edge. We are sad to inform you that on March 4, the eagles abandoned their eggs after 28 days of incubation. Possible reasons for this are: egg predation (a great horned owl, for example) or outside interference (humans too close to nest or another adult eagle). We suspect interference by another adult eagle. We have determined that our female is still here. The posted photo by Dennis Ruffe taken March 15 identifies her by the leg bands. We have yet to positively identify if it is still our same male, who has no leg bands. 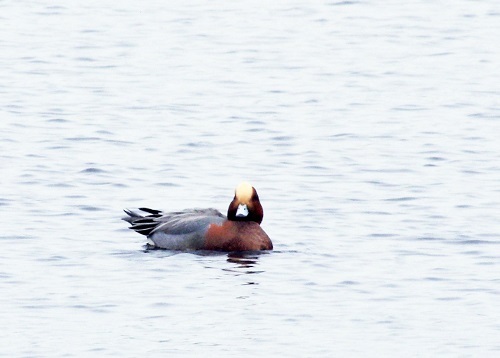 The pair is frequently seen together at the reservoir. 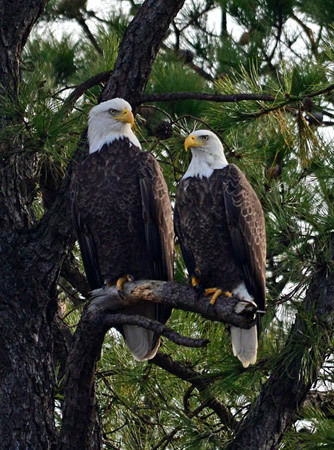 Manasquan Reservoir Eagles Are Back! 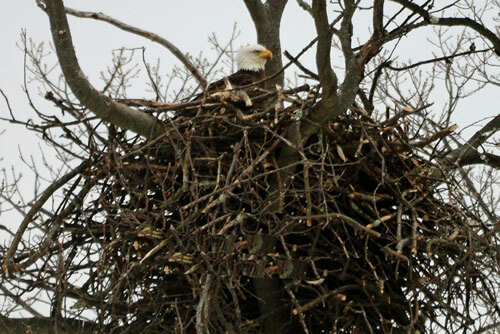 The Manasquan Reservoir eagles have moved their nest back to the shores of the reservoir. They have taken up residence in their favorite tree after nesting off park property during 2015. Incubation began on February 5, 2016. The new nest is on a nesting platform built for them in 2012. That year the eagles’ nest was supported by a dead limb and near collapsing. 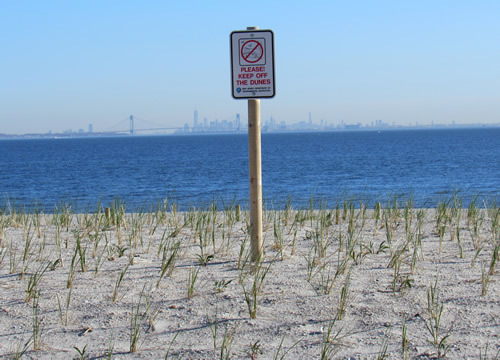 The Endangered Species Division of the NJ Department of Environmental Protection (ENSP) had successes “building nests” for eagles in other locations under similar circumstances. With the assistance of the ENSP, the Monmouth County Park System decided to try the platform at the Manasquan Reservoir for the eagle pair. Just before hurricane Sandy in October of that year the nesting platform was built. It wasn’t until January 2016 that the eagles finally decided to use it. 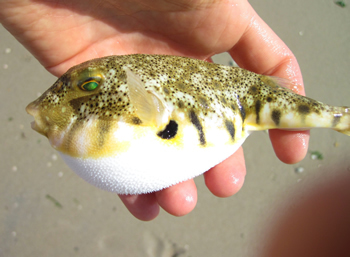 During a recent saltwater seining program near Sandy Hook Bay, Park System Naturalists found a blowfish or a Northern puffer fish in a seine net. 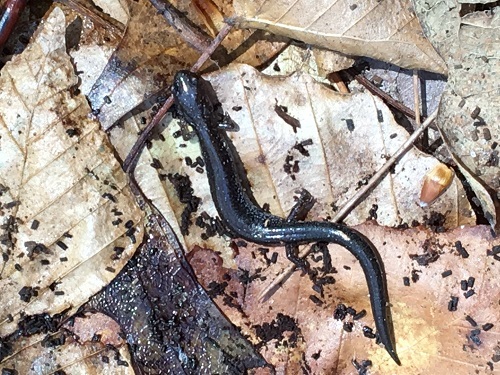 Without a doubt, third graders visiting the park during a school field trip were thrilled to see the little fish as it puffed up about twice its size by inhaling air or water into a special organ near its stomach. Thanks to improving water quality in New York Harbor, blowfish are becoming more common sights. They can be found from spring through fall, leaving the harbor in the winter for deeper ocean waters. Posted 6/2/2015. This is a very secretive bird and if were not for their loud and distinct call most would go unnoticed. 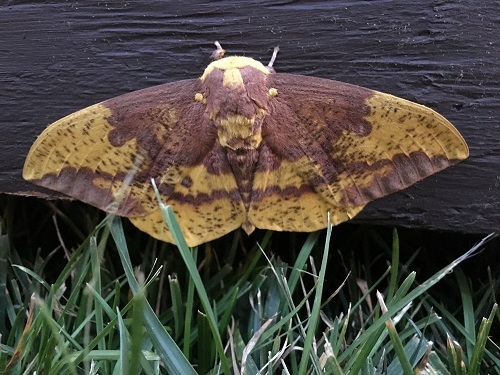 It is a common breeder in Monmouth County and can be found in most of our parks during the summer months. 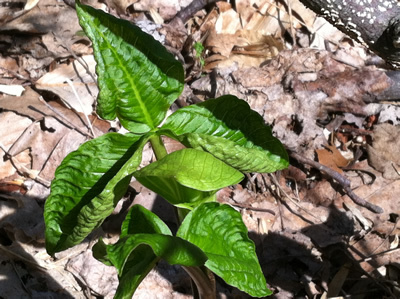 Park staff recently found a plant called nodding trillium, or trillium cernuum, at Thompson Park, Lincroft. This is the first time staff has identified this species in the parks, although other trillium species have been reported from some of our western Monmouth parks. 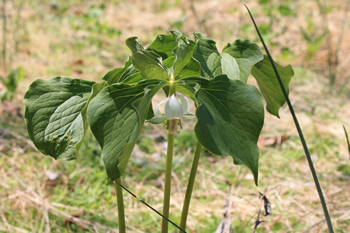 Trillium are not studied particularly well in the state, but many are increasingly rare throughout their ranges due to habitat destruction and deer herbivory. The seeds are typically dispersed by ants, which carry the fleshy coated seed away from the flower, consuming the fleshy parts and depositing the seed. 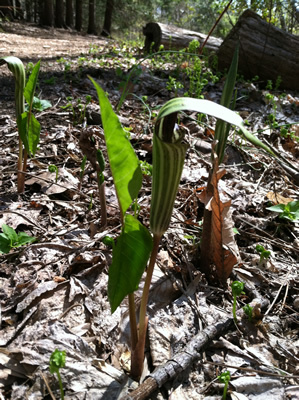 It’s probable that this plant has been here a long time – and just overlooked when not in bloom, as its leaves do resemble non-flowering Jack-in-the-pulpit. 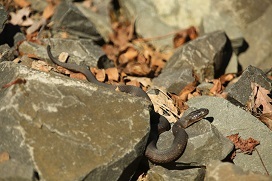 Our Roving Naturalist group happened upon this northern water snake during the Earth Day celebrations on Sunday. 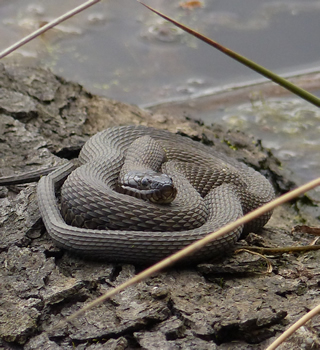 The northern water snake is a fairly common sight in the spring and summer near the lakes and waterways in our parks. 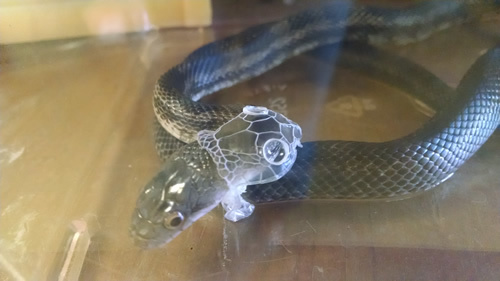 They are often mistaken for the venomous cottonmouth water moccasin. 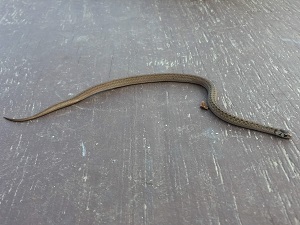 The northern water snake does have a triangular shaped head, which is a trait often used to distinguish a venomous snake from a non-venomous one. The cottonmouth's northern range stops in Virginia and does not extend into Maryland, Delaware or New Jersey. 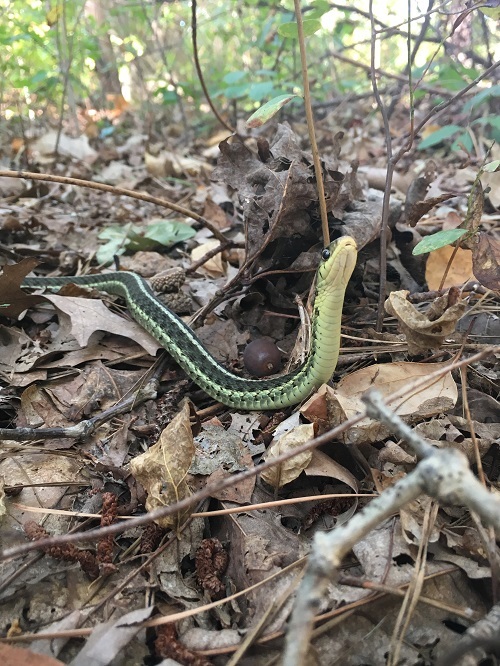 There are no venomous snakes indigenous to Monmouth County. 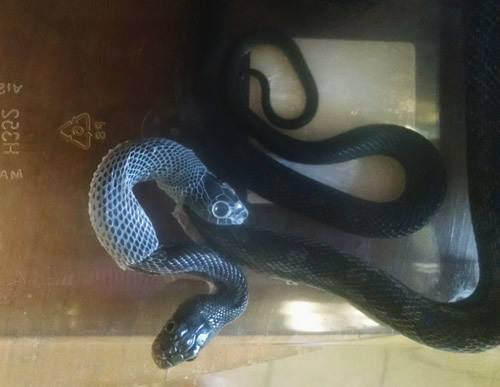 These are harmless snakes that will slither away into the water or beneath a rock when approached too closely. Hatching began later then previous years occurring March 2, possibly due to extremely cold weather conditions. This nest is the third in the state to have hatched so far. 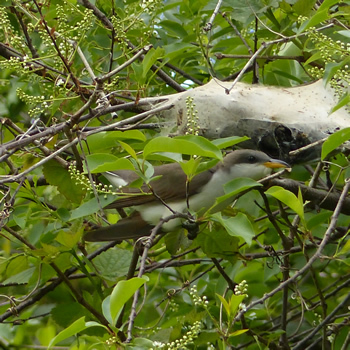 Reports are that many nests monitored throughout New Jersey have are delayed. 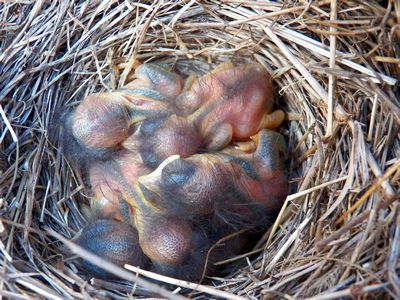 Typical indicators of hatching are changes in behavior such as an adult sitting higher in the nest and feeding the young. However, we will not have a chick count for at least three weeks. They need to grow enough to be seen above the nest edge; then we need to see all the heads up at the same time to get an accurate count. Eagles typically have between one to three chicks per season. 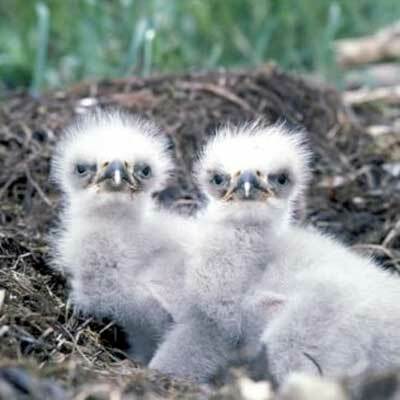 Eaglets grow quickly, almost matching their parent’s size by six weeks. This requires a lot of food, especially fish, a favorite in their diet. This is another reason why the Manasquan Reservoir is great eagle habitat. 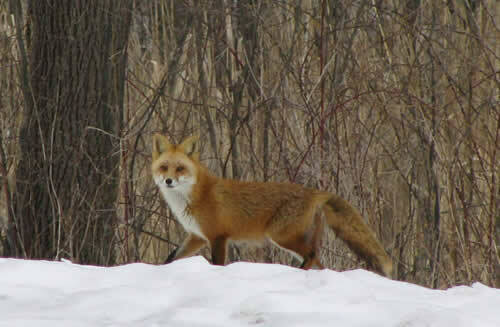 This red fox was spotted by Marlu Lake in Thompson Park. 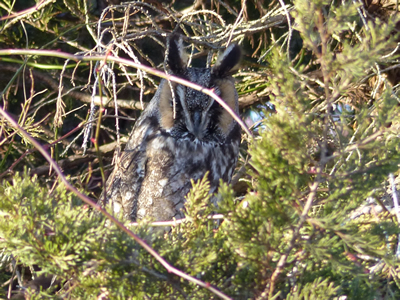 The Long-eared Owl was a former breeder throughout New Jersey from Sussex to Salem County. The clearing of forest for agriculture and general development during the late 1800’s and through the 1900’s reduced the number of breeding locations. The number of breeding pairs declined steadily through the 1960’s and 1970’s. There was an extensive search in the 1980’s but only a few nesting pair could be found. 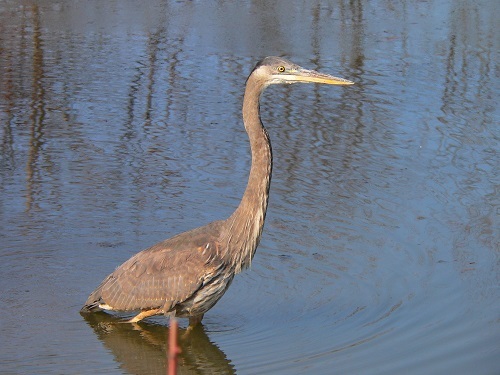 In 1991 the bird was listed as threatened in New Jersey and is now considered a rare winter visitor. Long-eared Owls are long lanky owls with two long tufts on top of their head. These owls are strictly nighttime feeders and fly low over open fields in search of mice, voles and other small mammals. They weigh just under a pound, have a wing span of about 39 inches and are about 16 inches long. 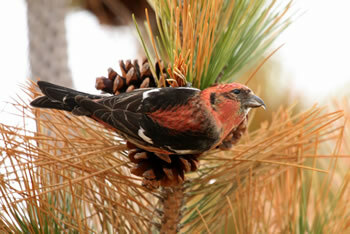 They prefer to roost in evergreens such as spruce, pines, cedars, and hemlocks. 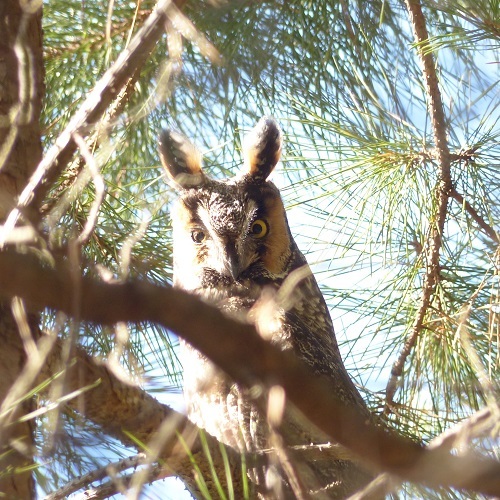 The Long-eared Owls can arrive in NJ as early as November and are usually gone by the end of March. 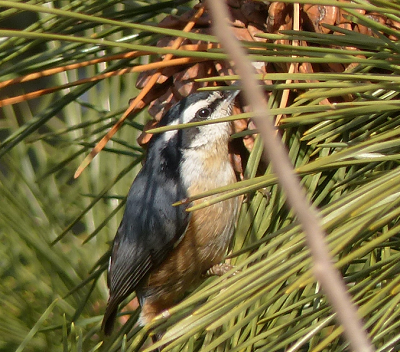 Several have been seen in our parks this year and this one was photographed this week by one of our Naturalists. 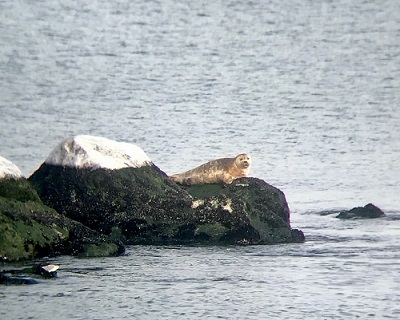 Recently, a Harbor Seal, a typical winter visitor to Sandy Hook Bay, was seen at the Bayshore Waterfront Park in Port Monmouth. A Park Naturalist observed the seal early in the morning resting on a wooden dock most likely after a night of hunting or traveling. Harbor Seals frequently travel from northern New England or Canada to over-winter along the Jersey Shore. While here, seals will rest and feed on a wide variety of fish and crustaceans before swimming back north to mate in the spring. If you see a seal, please do not disturb the animal. Enjoy the sight from a distance. Harbor Seals and other marine mammals are protected by the federal Marine Mammal Protection Act. If you see a seal that appears injured, entangled, sick, or being harassed by a person, please call the Marine Mammal Stranding Center at 609-266-0538. 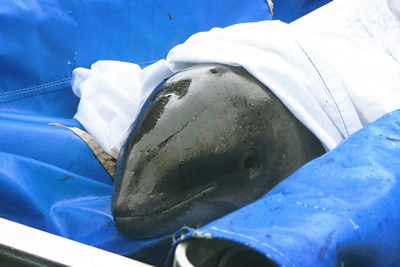 This organization has the authority to help stranded or sick marine mammals and sea turtles. Learn more about these fascinating creatures during our Harbor Seals of New Jersey presentation and hike on Saturday, January 17. Registration and fee required. Online registration available. Fall is in the air! 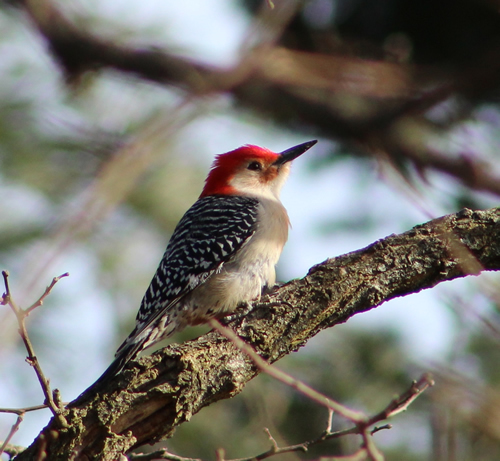 It’s a wonderful time of year to enjoy the colors of the season and look for birds migrating through our parks. 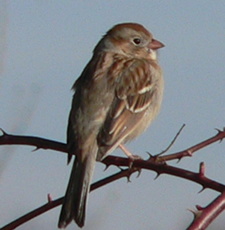 October and November are prime months for sparrow migration. Sparrows are a group of birds that are so similar in color and general appearance that many just refer to them as “LBJs” or Little Brown Jobs. 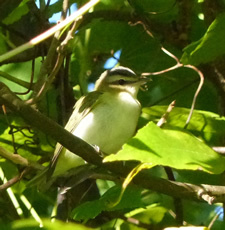 About 30 species have been seen in New Jersey. 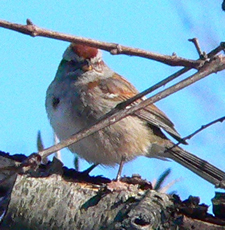 Some such as the white-throated sparrow and dark-eyed junco will winter here and others that have been here all summer such as the Chipping Sparrow will leave and head south. 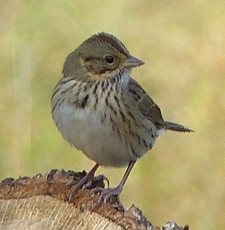 Still others such as the song sparrow, swamp sparrow and the field sparrow can be seen in New Jersey year round. 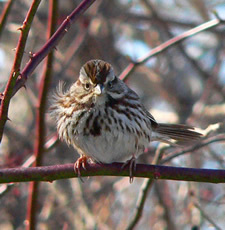 Sparrows are primarily ground nesters and seed eaters. 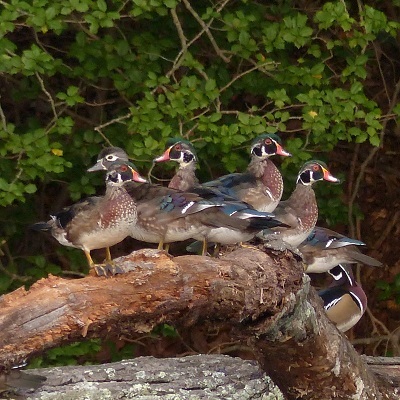 These LBJs can be seen traveling in large mixed flocks through most of our parks this month. The praying mantis is one of our more fascinating insects. There are about 20 species that are native to North America and several exotic species that have been deliberately introduced. All mantises are carnivorous and have a voracious appetite, feeding almost continuously throughout the day. Mantises feed on insects, frogs, snakes, lizards and will even eat other praying mantises. Many gardeners consider these eating machines to be highly beneficial. 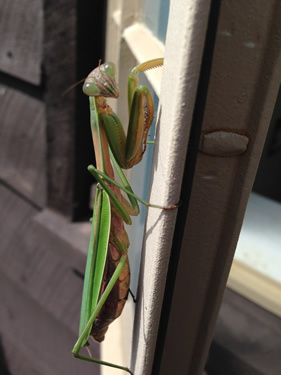 However, the mantises do not discriminate and will eat beneficial insects as well as those considered pests. A hungry female mantis may devour the male after mating. The cautious male mantis will seek out a well fed female for courtship and often escape the encounter. Read more about fall bird migration in our Fall issue of the Green Heritage. 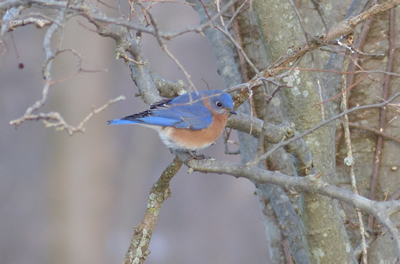 This photo was taken by our volunteer Mary Jane Davis, a Bluebird house monitor at Dorbrook Recreation Area. Ms. Davis is a teacher at Red Bank Catholic High School whose students built and installed the bird houses. 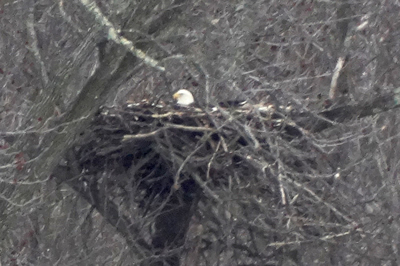 We are happy to announce there are two eaglets in the Bald Eagle nest at the Manasquan Reservoir in Howell. Over the next few weeks, these eaglets will change quickly. By six weeks they grow to nearly the size of their parents and their grey down will become black feathers. At 10 to 13 weeks (approximately May), they will take their first flights. 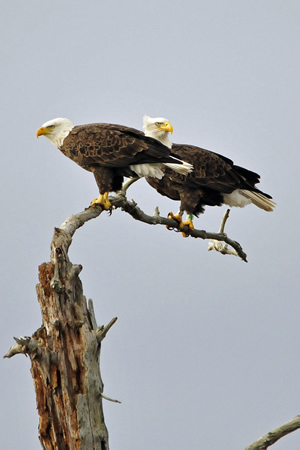 Interested in learning more about the eagles and their history at the Manasquan Reservoir? 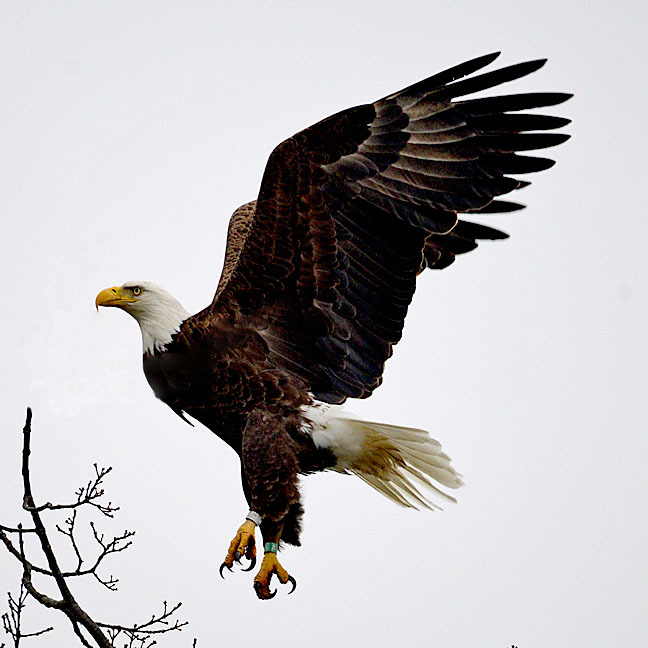 On Sunday, April 13 at 10:00 am we are offering Bald Eagles at the Manasquan Reservoir (#I0942A). Online registration is available by clicking on the title of the program. 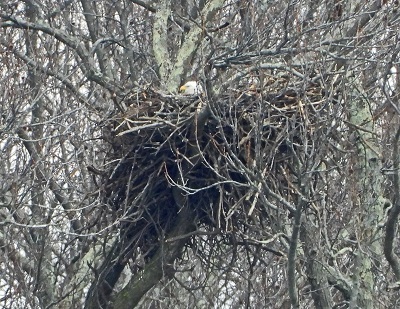 During the last week of February, egg hatching began in the Manasquan Reservoir Bald eagle’s nest. At present, we can’t see the chicks because they are too small. How do we know hatching occurred? It’s all about changes in the parent’s behavior. We observed the sitting adult moving around more, sitting higher in the nest, looking down often, and most importantly we observed feeding behaviors. 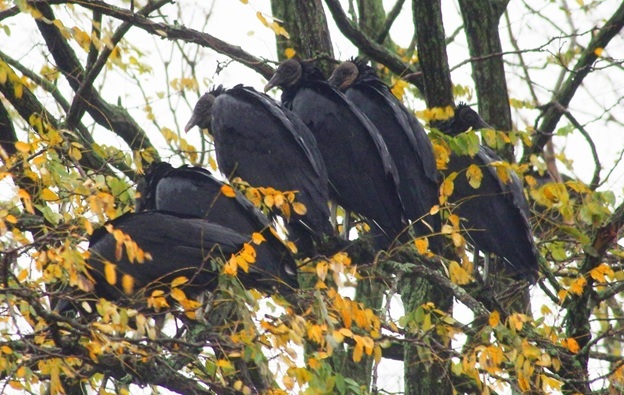 The next big question is how many eaglets are there? We will have to wait and see. It will take another week or two before they are big enough to be seen easily. Last Friday, several people joined a Park System Naturalist for a full moon beach walk along Sandy Hook Bay at Bayshore Waterfront Park. 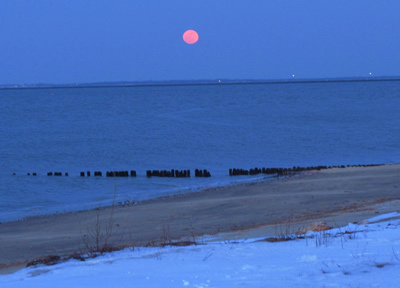 It was Valentine’s Day and a beautiful evening to watch the moon rise over the bay. Winds were light, the sky was clear, and temperatures were relatively balmy in the lower 30s. It was a full “snow” moon, named by many prehistoric Native American people in the Northeast, since some of the heaviest snowstorms took place during this time of year. 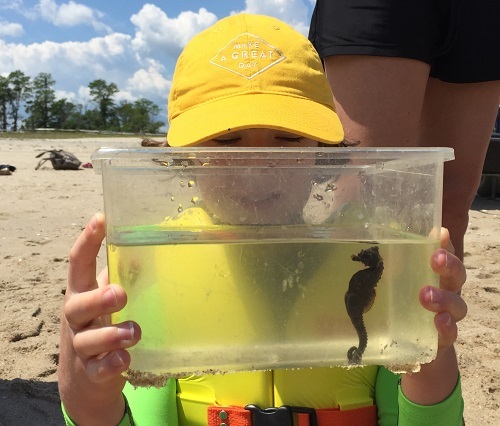 These are exciting times at the Manasquan Reservoir! On January 21, our resident Bald Eagle pair began incubation. From now until hatching, one of the adults will almost always be seen on the nest. Eagles begin sitting immediately upon laying their first egg, but may produce up to two more eggs over the next few days. If more than one egg is produced, the eaglets will hatch in the order they were laid over several days. Generally, incubation requires about 35 days. This makes the approximate date of hatching during the week of February 24. 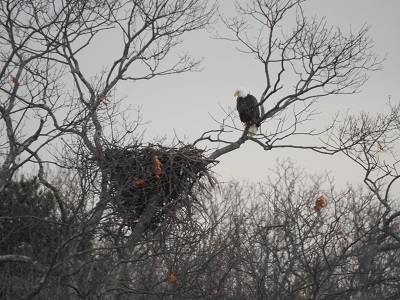 The eagles' nest can be viewed from the Manasquan Reservoir Environmental Center, weather conditions permitting. spring. Loss of habitat, people removing them from the wild, and slow reproductive rates contribute to the Eastern Box Turtle being listed as a Species of Concern in New Jersey. 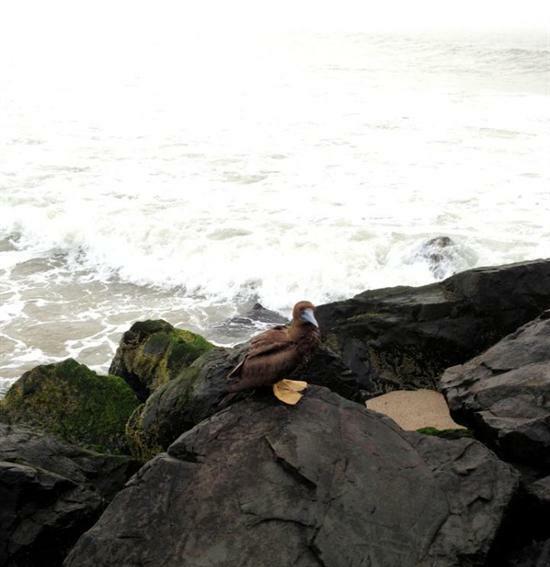 Park Ranger Pat Becker spotted this Immature Brown Booby on the end of a jetty at Seven Presidents Oceanfront Park, Long Branch, on July 2. 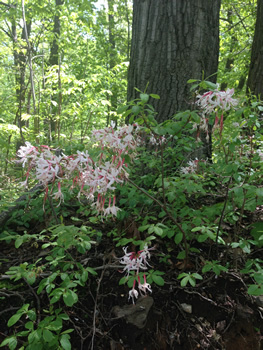 If you take a walk on the trails at Huber Woods you will see clusters of this strange looking white plant. 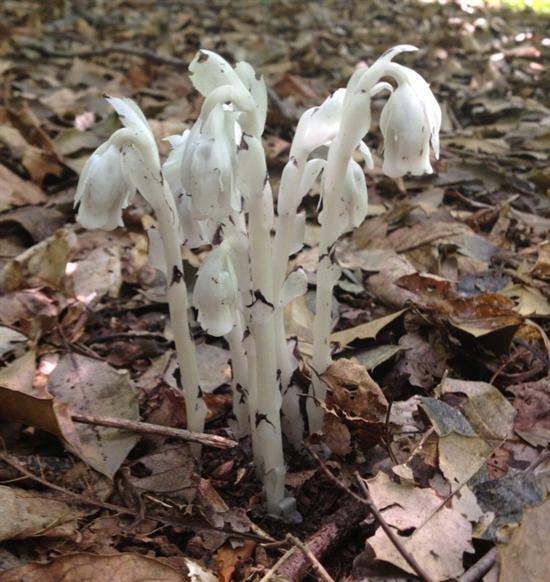 This is Indian Pipe, also known as Ghost Plant. Since it lacks color, Indian Pipe is one of the easiest wild plants to identify. It grows from June to September reaching a size of four to ten inches tall. 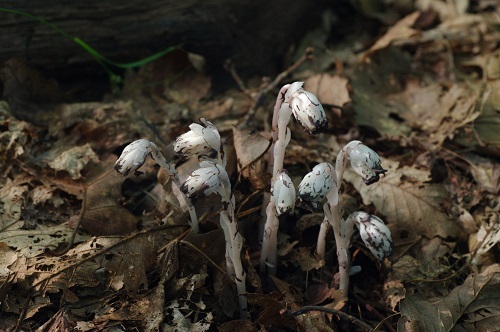 The Indian Pipe prefers shady woods with rich soil and decaying plant matter. 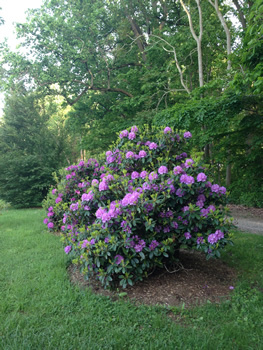 It blooms with small waxy flowers that droop and is a favorite food source for small bumble bees. The plant turns black when it gets old. June marks the peak of the spawning season for the Bluegill sunfish. 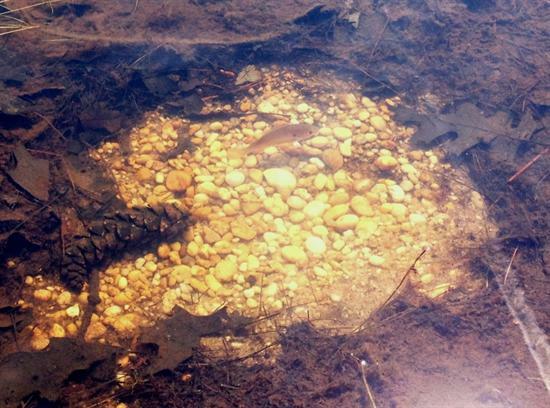 While at Shark River Park stop by the lake and check out the numerous fish nests near the shallow edge of the water. They are the result of the very hard working male bluegill. Each year they claim a territory to build their nest. Using their tail they scoop out a six to twelve inches in diameter spawning site in the gravel or sand, where they will wait for a female to arrive and deposit eggs. After the eggs are deposited the male stays and guards the nest from any intruders. In addition to being a watch dog, he is constantly using his tail to fan out the silt from covering the little, fragile eggs. 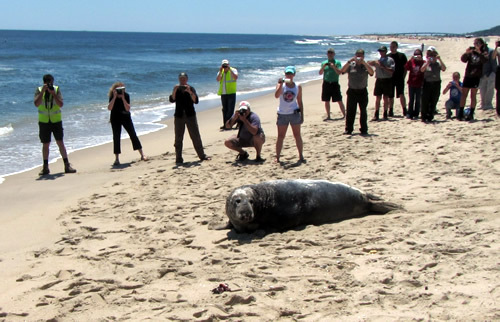 Recently, an adult 600-pound plus Grey Seal was released back into the Atlantic Ocean at Sandy Hook. 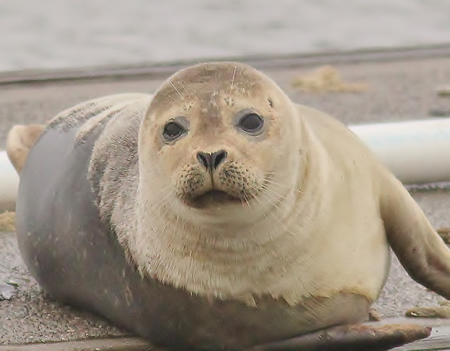 The seal was found sick and mal-nourished in February 2013 near Seaside Park. After several months of care and treatment from staff at the Marine Mammal Stranding Center in Brigantine, NJ, the seal was healthy enough to send back into the wild to be free. The seal was released at Sandy Hook because of its location &S211; it&S217;s the northern most spot along the Jersey Shore and nearest to New England and the Canadian Maritime provinces where the western Atlantic population of Grey Seals often gathers to breed, feed, and haul out to relax during the summer. 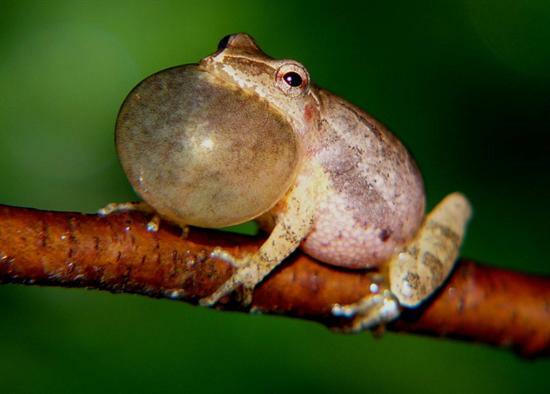 The trilling call of the male Northern Gray Tree Frog can be heard on mild, humid nights from late April to August when the temperature rises above 60 F. Tadpole development is quite rapid and the bright-green juvenile frogs appear at the edges of their birth pond in mid-July. The almost identical looking Southern Gray Tree Frog is endangered due to habitat loss. The Southern Gray has a quicker, shorter, and higher pitched trill. 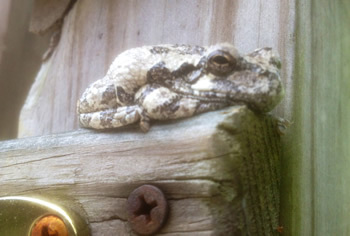 Generally the Southern Tree Frog is not found in Monmouth County. 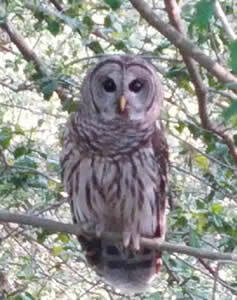 This Barred Owl was photographed in Hartshorne Woods as it flew out to investigate a man washing his car. The Barred Owl has become a rare sight in Monmouth County due to habitat encroachment and destruction. 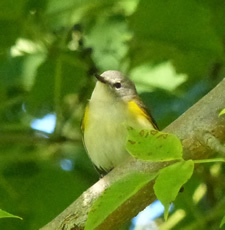 It was placed on the NJ Threatened Species List in 1979. The Barred Owl is known by many colloquial names including; Swamp Owl, Hooter Owl, Eight Hooter, Rain Owl, Wood Owl, and Striped Owl. 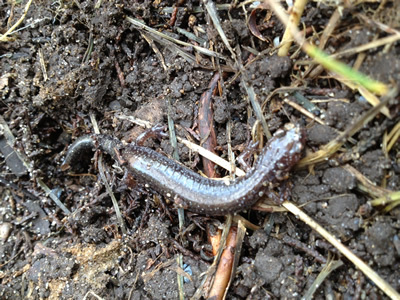 It has well established populations in remote wetland areas and the highlands areas of the state. 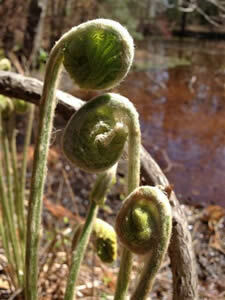 Spring is here and the sight of fern fiddleheads along the pond at Huber Woods Park is just another reassuring sign. These fiddleheads are the beginning of the Cinnamon Fern. Cinnamon Ferns are large ferns native to the Americas and Eastern Asia; their leaves grow up to six feet long and a foot wide. 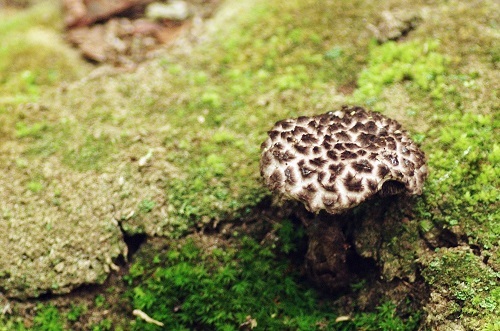 They grow in large clumps in moist woods, marshes, wet ditches, and stream banks. This fern often grows alongside other plants, such as Highbush Blueberry and Greenbrier. In early spring, new young leaves start to grow. They look like a skinny stem, which uncoils into a leaf. These young skinny structures are called "fiddleheads." Fiddleheads are eaten by white-tailed deer and other animals. Cinnamon Fern provides good cover and protection for small animals, such as squirrels, toads, birds, snakes, and insects. Posted 04/22/2013. 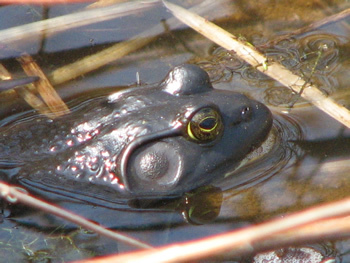 Bullfrogs are found throughout the state in any permanent body of freshwater; however, they are not found in the core pine barrens due to areas naturally acidic water. 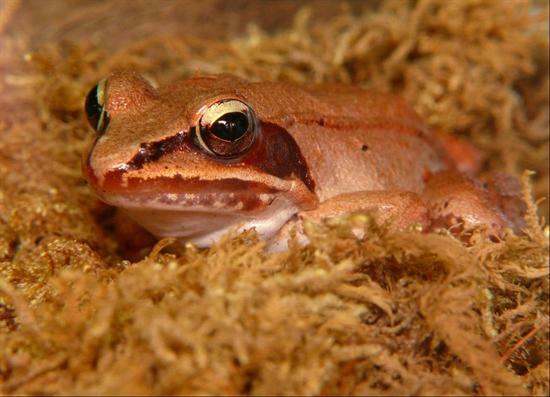 They are considered an invasive species in New Jersey and have displaced our native Carpenter Frogs and the threatened Pine Barrens Treefrog. 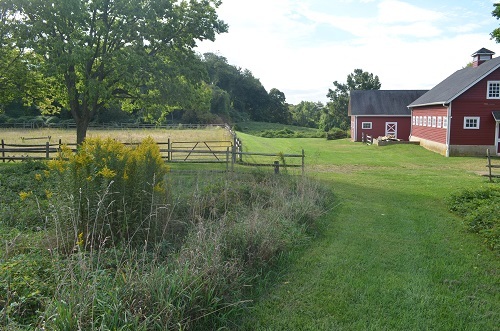 The bluebells are blooming at Historic Walnford, Upper Freehold! 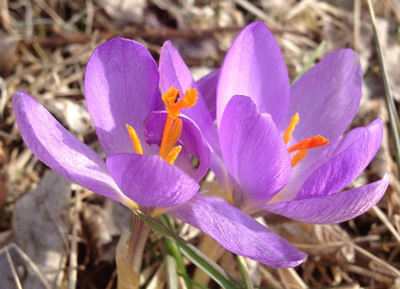 These colorful wildflowers can be found along the banks of Crosswicks Creek. Even better, there&S217;s a good chance that the flowers will be at their peak for the Bluebell Festival on Sunday, April 14th. At 4 to 5 weeks eaglets can stand and feed themselves. By 6 weeks they are almost as large as their parents and they take their first flights around 10 to 13 weeks. 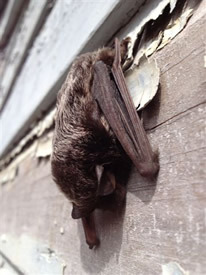 One of our Park System Naturalists spotted this Silver-haired bat hanging on the side of one of the out buildings in the Timolat Section of Huber Woods recently. The bat appeared to be in great condition and was taking advantage of the warmth of the buildings southern exposure. Silver-haired Bats can be quite common when migrating and will be found on the sides of buildings, railroad ties and fence posts. This bat is a tree bat and it usually does not roost in large colonies. 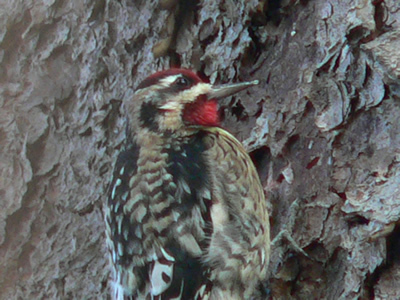 It typically roosts under loose tree bark but will also use woodpecker holes and bird nests. The Silver-haired bat was not affected by the &S220;White-nose Syndrome&S221; fungus that has devastated cave bats. This year the NJ Bat Sanctuary has experienced an increase in calls regarding the Silver-haired bat and many of the reports are from Monmouth County. These are medium sized bats with a wing span of 11 to 13 inches and weighing .3 to .4 ounces. 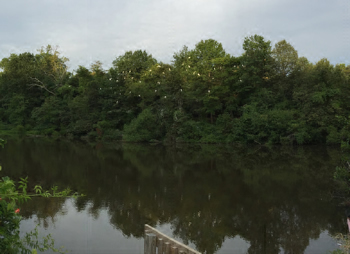 Manasquan Reservoir Bald Eagle Update!